Have I written before that early 1970s TCMA was all over the place? Is there a running theme to these offerings? 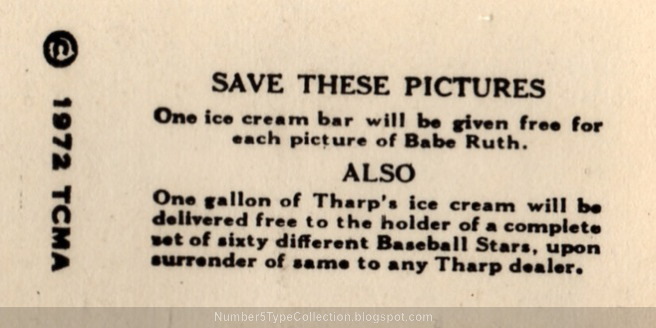 This crazy assortment doesn't even mention today's enigmatic reprint of the rare 1928 Tharp's Ice Cream set, with HOFer Gabby Hartnett pictured below. By "enigmatic," I mean that "Google search can't find a freaking checklist." These cards look simple and innocent, but can drive vintage collectors nuts. A half-dozen different issues, including Pennsylvania ice cream makers Tharp's, Yuengling's, and Harrington's, share 1 card design and list of players. Thanks to poor printing technology, even authentic examples look a lot like modern photocopies. (The haziness around Mr. Hartnett's head isn't bad work on TCMA's part--1928 originals really look like that.) Some collectors shy away just to avoid being ripped off. Catalogs designate these ice cream sets collectively as F50. Collectors who want a specific maker (i.e., Tharp's) must check the back text. Old Cardboard has both a nice set profile and history of Tharp's Ice Cream that ties all 3 together. TCMA sold sets direct to collectors by mail order or in-person at shows, so I assume many remain complete. This single turned up on eBay a few years ago. Value: While hard to find, individual cards should run less than $10. 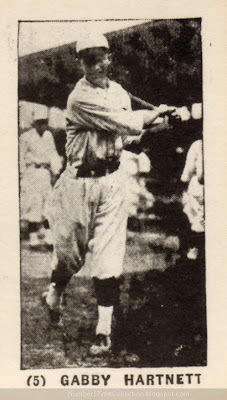 Original Ruth cards cost thousands, so his reprints from this set probably run higher. Fakes / reprints: Pretty sure no one reprinted these reprints, since faking the original F50s would be far more lucrative.